Spring’s almost here, which means sunlight, warmth, open windows—and spring cleaning. Before you get down to the sweeping, vacuuming, mopping and window cleaning (and probably a lot more), it’s a good idea to clear out clutter and organize your living spaces first. That means lots of sorting, removing and eventual storing. Using the right material and supplies can help you do all that easier and faster, with minimal headaches and less time wasted. Here’s our 6 spring cleaning tactics using packaging supplies and materials. Have 3 boxes at the ready during your spring cleaning efforts: keep, donate and toss. This will keep you organized, your floor as clear as possible, and your time moving efficiently. When you’re done sorting, simply work backwards: bag up and throw out anything in the ‘toss’ boxes, drop off your ‘donate’ boxes and then set about sorting anything you’ve got in your ‘keep’ boxes. When you start digging into your ‘keep’ boxes, transfer any objects you’re storing into moving boxes. They’re specifically designed to prevent overpacking and are built to standard sizes so they can be neatly stacked and organized. You won’t ruin your back lifting them, and you’ll make optimum use of any storage space you have. Some clothes don’t do well when they’re folded, so what do you do when you’ve still got to store them away? 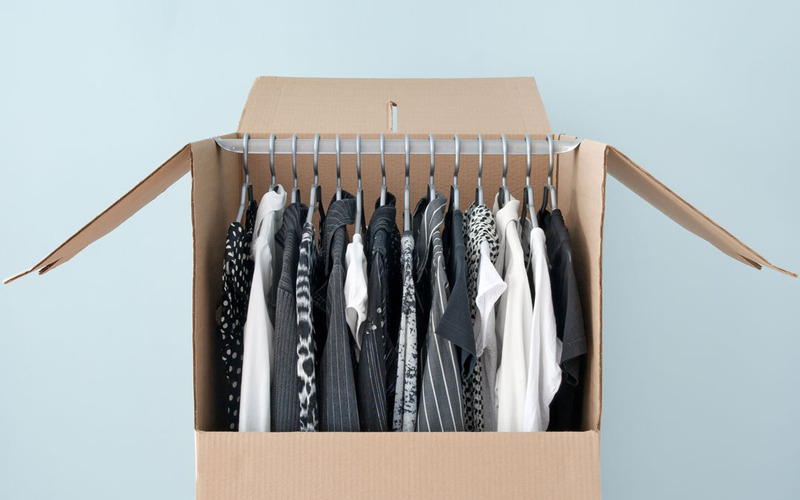 If you’ve got the space, wardrobe boxes can solve both the folding and the storing problem. Built with a hanging bar inside, they can accommodate a solid wardrobe, whether that’s dresses, shirts, suits or winter jackets. Organizing wardrobe boxes by season or clothing type can make it easier later on to retrieve your clothing of choice. When you’re packing away seasonal clothing, plastic bins can be a serious boon. They’re a better choice than corrugated boxes for long term storage, because they’re better at keeping out light, dirt and moisture. With spring here, store away winter clothing like jackets and sweaters, and bring out all those colourful summer clothes. When fall inevitably comes back, bring out the winter clothes and tuck the summer clothes away. It’s a smart system. There’s probably a surprising amount of paperwork hanging around in your home office or bedroom. Once you’ve identified what you can get rid of (don’t forget to shred anything with important personal information on it), organize everything you’re keeping, if you haven’t already. Build a few file storage boxes and file away based on category, date, or whatever system works best for you. Stack these filled boxes off to the side or in a closet, and you’ll find your workspace clear and your mind at ease. While this won’t help you organize your house, this is a spring cleaning tactic you should still take part in. We all know we should have a first aid kit in our homes, and once we buy one, we tend to feel like our job’s done. But with how busy life can feel, we can forget to replenish first aid supplies after we use them. That can leave you in a bind if something happens and the things you need aren’t inside that kit. That’s why health and safety experts suggest checking your first aid kit every 6 months. Replace any supplies that are missing, and refresh any supplies that are past potential expiry dates. Those same experts suggest scheduling your kit check for every time you switch the clocks over. This way your kit stays filled and ready, and your mind can move onto other things. Cleaning up isn’t everyone’s cup of tea, but it’s a necessary thing sometimes. After all, who wants to live in a dusty, cluttered house? Certainly not us, and we wager certainly not you. With these spring cleaning tactics, and some simple but effective packaging supplies, your place is going to be clean, organized and looking great in no time. Happy cleaning, and don’t forget to put on a really good music playlist!